Skiing has exploded in popularity over the last decade, leading pioneering travellers to heli-ski in Albania or to traverse the Bamiyan mountains of Afghanistan. When you think of skiing in Asia, Niseko in Hokkaido is certainly top of mind. While it's no longer a secret—Niseko has been dubbed "Japan's Aspen"—this alpine paradise is celebrated for its stunning scenery, consistent fall of powder snow, and thriving après-ski scene that attract winter sports lovers the world over. Development in Niseko has markedly increased matching the growing appetite for skiing in the region. The latest statement is made by the newly-opened Skye Niseko, a high-end ski-in, ski-out hotel that promises guests the most comfortable home on the slopes. 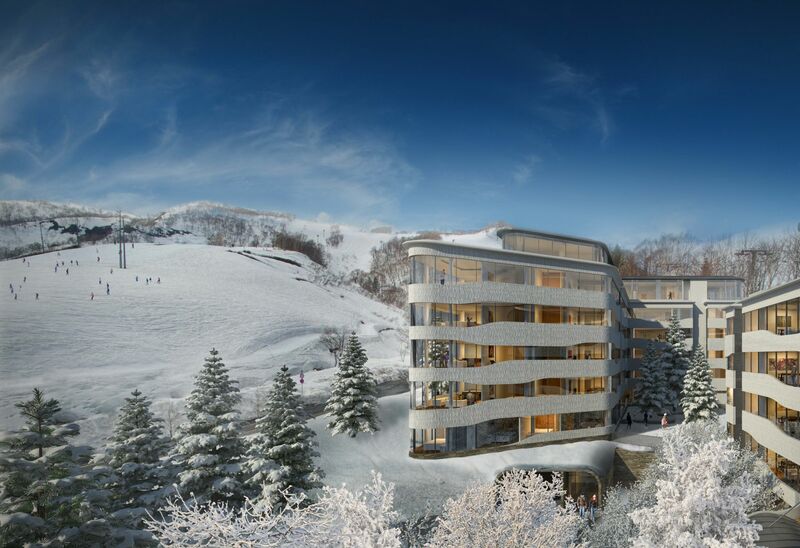 Just minutes from Kutchan town, the biggest gateway to Niseko's prime ski area, its 105 apartments and penthouses maximise the views and provide easy access with two runs on either side of the resort. Getting to Niseko is part of the fun: Weaving through the winter landscape and natural wonders such as Lake Shikotsu, the 2.5hr drive aboard Sky Express, a lauded provider that offers door-to-door transfers all over Hokkaido, went by like a breeze. When I arrived in Hirafu, I saw plenty of non-descript buildings so Skye Niseko's sinuous architecture truly stood out. Plus, it was one of the few hotels with a proper driveway to boot (yes, entrances matter). Lucas Fuller, CEO of Summit Developments, believes that its location in Upper Hirafu gives Skye Niseko a significant advantage. "We would like to believe that the quality of design and finish sets us apart, but I suppose the single biggest differentiator is the location. Set at the highest point of the village and with ski runs on two sides, it is unbeatable and unrepeatable." The check-in was manned by mostly English-speaking staff, who aptly welcomed us with a friendly briefing on the property's amenities and outlined activities that their concierge can take care of. My reservation was handled by The Luxe Nomad, which booked my companions and I in a three-bedroom suite, consisting of a 2-bedroom unit and a connecting 1-bedroom unit (Rooms 507 and 508). The first thing that captured my attention was the expansive windows, which follow the flowing lines of the building and elegantly frame the pristine alpine view. From my vantage point, I could see skiers and snowboarders go down the Alpen run—a source of live entertainment and inspiration for a novice skier like me. The suite's interiors replicate the hotel's minimalist design by Wilson Associates—ivory walls, neutral-hued furnishings, and touches of warm wood make for a stylish cocoon. The generously-spaced, open-plan common area is comfortable for a group of 6; everyone can read, relax, eat, and watch Netflix with ease. I adored the fully-equipped kitchen, which has a marble-clad island and all the appliances and crockery you need (including luxury Miele ovens), as well as the inclusion of a modern fireplace in the living room. Each of the rooms has a residential character complete with en-suite bathrooms with heated floors. The ski season in Niseko can typically last until early April, and Skye is well-equipped to handle the influx of travellers who come to enjoy the 14m powder snow. In fact, the ski valet is one of the highlights: they stock sparkling new gear, have helpful staff who patiently guide you through the process, and is located just a few steps from the slopes. Staff suggest that guests come the day before to get fitted; the ski valet keeps the gear overnight. While Niseko is known for winter sports, it has its roots as a hot spring destination. Skye pays tribute to this by providing a common and private onsen, as well as a rotenburo (outdoor onsen) for each of the five penthouses. Wellness is also of paramount importance here: you can get massages or try the float tank at Ryko Spa, exercise at the gym, as well as delight in the healthy food and drink options on offer. The culinary heart of the hotel is Kumo, an all-day restaurant that serves "Japanese soul food" by day and transforms into a "dazzling Hokkaido izakaya" come night-time. The breakfast buffet is quite comprehensive, with both Japanese and Western options plus plenty of healthy choices including a spread of locally-sourced fresh vegetables, a welcome addition. Rice bowls and set meals abound are served at lunch, so you can fuel up on classics like kaisen-don or perhaps Hakata ramen. The dinner menu reads more like that of an international izakaya, understandable given that majority of visitors to Niseko are foreigners. While I expected more local (or even regional) dishes and produce, Kumo is a good place to unwind whether you want a light bite or a tasting course; it's also a godsend for large gatherings as few restaurants in town can accommodate groups. The hotel does not offer room service but guests are welcome to pick up drinks and snacks at the Cafe Deli or, better yet, take advantage of the beautiful kitchen. The suites at Skye Niseko are designed for staying in so do spend some time indoors (and light the fireplace while you're at it). If you're inclined to cook, you will enjoy the spacious, well-equipped kitchen but remember to buy ingredients beforehand (the nearest supermarket is a downhill stroll) or book the hotel's shopping and delivery service. Niseko isn't short of places to eat—we suggest trying the nearby Roketto Niseko, a bijou resto-bar by Singaporean chef Willin Low—but the popular restaurants get booked up in advance so contact the concierge to avoid disappointment.